The pearly iridescent Texas cichlid fish can grow to a large size in your aquarium, so you'll need a large freshwater tank. Even if you have space, you might want to learn more about this aggressive fish that is known for its sparkly, speckled coloring. Texas cichlids are native to lakes and rivers in south Texas and northern Mexico, making them the most northern naturally occurring species of cichlid in the world. It is the only native cichlid in the U.S. and amongst the first cichlids imported to Europe, having first been imported in 1912. Popular within the aquarium hobby, Texas cichlids are commonly stocked in most shops, sometimes under the name pearl cichlid or Rio Grande perch. The latter name comes from an area where it is often found, the lower Rio Grande River in Texas. In Mexico, this species is called mojarra del norte. Specimens sold in shops are often captive bred. This species has also been introduced into areas they are not indigenous to, sometimes on purpose, but often by aquarium owners desperate to divest themselves of a fish they can no longer take care of. The areas of non-indigenous populations range from northern Texas to Florida, where it has become a popular game fish. This is due to having a tasty flavor similar to that of their distant relative, tilapia. There are a number of crossbred or hybrid species from the Texas cichlid. A species often referred to as the red Texas cichlid is a hybrid of the Texas cichlid and a species from the genus Amphilophus. It is believed that the popular man-made flowerhorn cichlid is also a crossbreed created using the Texas cichlid. Texas cichlids are a large and aggressive fish that can reach up to a foot in length, although most sold in the aquarium trade attain an adult size that is a bit smaller than that. 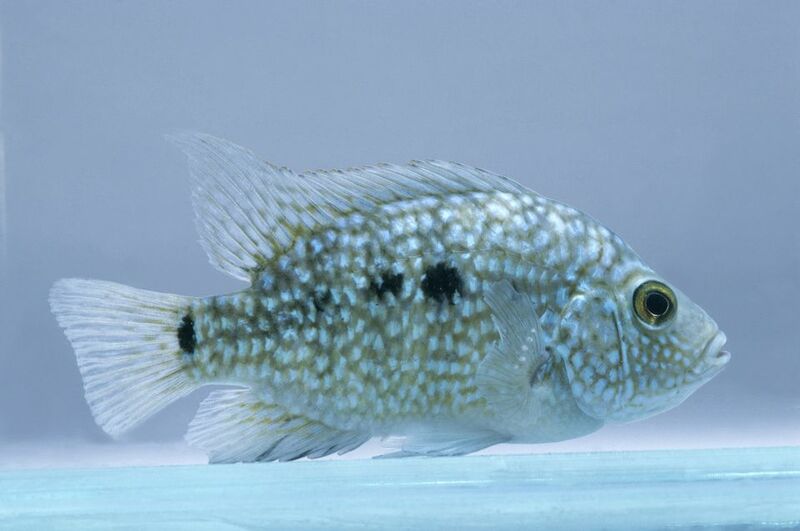 The body of this species is pearl-gray with blue- to green-hued scales that give the appearance of pearly iridescent speckles, giving it one of its common names of pearl cichlid. The iridescent speckling extends into the fins. A dark spot is clearly visible at the base of the tail, and several more spots or bars are in the center of the body. Mature males develop the traditional nuchal hump on the head above the eyes. When spawning, the fish assumes a striking half and half coloration, with the front portion of the body becoming white, and the rear and underbelly being black, or black-and-gray barred. Texas cichlids are aggressive, which must be kept in mind when selecting tankmates. They should only be kept with other large species of fish that are capable of fending for themselves. When spawning, they should not be kept with any other fish, as they are quite likely to kill any other fish in the tank. This is true of even their own species, as spawning pairs are highly aggressive. Other large Central or South American cichlids are suitable tankmates, as are oscars, silver dollars, and tinfoil barbs. When kept with other large species, the tank should be as large as possible to allow space for each to have their own territory. When considering tank size, bigger is always better for this species. The minimum tank size is 55 gallons for a single specimen and 75 gallons for breeding purposes. When keeping Texas cichlids with other large fish, the tank should be 125 gallons or larger. Anyone who has kept this fish is well aware that attempting to craft a beautifully aquascaped tank is a losing battle because this fish is an avid digger that will uproot plants and move small rocks and other items of décor. That doesn’t mean the tank should be devoid of plants or anything else, but be aware that it will be rearranged regularly at the whim of the fish. For aquascaping, it is best to mimic their natural habitat. Start with a substrate of fine gravel or sand, which emulates the sandy river beds of their native habitat. Include plenty of smooth rocks, bogwood, or driftwood. Driftwood is also beneficial in keeping the water pH softer and more acidic. Sturdy plants round out the habitat. Plant them so the roots are inaccessible, to prevent them from being uprooted. Floating plants are also a good option. Open spaces are needed, but so are roomy hiding spots. Large rocks and clay pots may be used for this purpose. Filtration should be robust, as this species is sensitive to organic waste. Perform weekly partial water changes to ensure water chemistry remains optimal. Texas cichlids tolerate cooler water temperatures, ranging from 68 to 75 F (20 to 24 C), although higher temperatures are well tolerated. The pH should be slightly acidic to neutral, and water hardness should range from 5 to 12 dGH. This species is omnivorous and needs both meaty foods balanced with vegetation. They are not fussy eaters and will eat virtually anything, including live, frozen, flake, and pelleted foods. Provide live foods when possible, such as worms and insects or insect larvae. Fresh vegetables can be fed as well, as well as spirulina flakes or pellets to keep their natural colors bright and maintain health. Sexual differences are not always clearly evident. However, males are usually brighter in color and iridescence, grow a few inches larger in size, and typically grow a protruding nuchal hump on their head. It has also been observed that fins of the males are longer and more pointed. One way to pick out female specimens is by the black spots located on their dorsal fin that are absent in male specimens. Texas cichlids are prolific, egg-laying, open spawners, which are easy to breed. Water in the breeding tank should be soft to medium hard (5 to 12 dGH), pH neutral (7.0) and between 77 to 82 F (25 to 28 C). Decorate with large rocks or clay pots to provide a choice of spawning locations. Breeding pairs are best obtained by purchasing a group of half a dozen young fish. Allow them to grow to maturity together, and pairs will form. Once a pair has formed, they should be separated to prevent them from attacking, or killing, each other. Condition the breeders with live foods, if possible, or good-quality frozen foods. When the pair is ready to spawn, their coloration will change dramatically. The head and the front portion of the fish will be white, while the belly, as well as the rear portion of the fish, will be black. An active courtship takes place, in which the pair will lock lips, slap tails, and dig in the substrate. After cleaning the chosen spawning location, the female will lay 500 to 1,000 adhesive eggs. This takes place in several batches with the male following the female to fertilize the eggs after they are deposited. The parents will guard the eggs, which hatch in two to three days. The fry will become free swimming by day four or five. Inexperienced breeders will sometimes consume their young, but will not do so in subsequent spawnings. The fry will accept freshly hatched brine shrimp either fresh or frozen. In lieu of brine shrimp, commercially prepared fry foods can be used. As the fry grow, finely crushed flake foods can be given before small pellets can eventually be offered.